1 Institute of Microbiology, Leibniz University Hannover, Herrenhäuser Str. 2, 30419 Hannover, Germany. Keywords: Pyoverdines, iron starvation, siderophores, Pseudomonas fluorescens, Pseudomonas aeruginosa, non-ribosomal peptide synthetases, periplasmic tailoring. In 1892, Gessard discovered yellow-green fluorescent pigments of bacterial origin that he termed fluorescins . These pigments, which later have been renamed pyoverdines by Turfreijer , could be discolored by acidification, and they recovered their color upon neutralization . It was proposed by Turfitt in 1936 that the ability to produce these green pigments may be used for classification purposes . Pyoverdine-producing bacteria are known today to belong to the genus Pseudomonas and form a subgroup therein, referred to as “fluorescent pseudomonads”. Pyoverdines from various strains have also been termed “pseudobactins”, beginning with a publication that introduced this term based on claimed but not further detailed chemical and physical differences to known siderophores . Subsequent structural analyses did not reveal any distinguishing characteristics to pyoverdines . In fact, the “pseudobactin” structure was the first solved structure of a pyoverdine, but the name pseudobactin still occasionally occurs in literature. First functional insights were based on studies by King and coworkers who described in 1948 the induction of fluorescin (= pyoverdine) production by P. aeruginosa under iron limitation . Totter and Moseley found in 1952 that the production is inversely correlated with the logarithm of the iron concentration over a wide range . It took 26 years, until the next major progresses regarding pyoverdine function were made. In 1978, Meyer and coworkers first determined the extremely high affinity of pyoverdine to iron that is in the range of 1032 , before they finally revealed the function of pyoverdine in iron uptake . It was concluded that pyoverdines are siderophores, which are iron-binding chelators involved in iron-transport into the cell . In agreement with this function, it later turned out that the production of pyoverdines is tightly regulated in response to iron by the regulator Fur . This review focuses on the biosynthesis and secretion of pyoverdines as summarized in Figure 1. For a more detailed summary on the discovery and earlier studies of pyoverdines, the reader is referred to an earlier excellent review . FIGURE 1: Current model for the biosynthesis, secretion, uptake and recycling of pyoverdines in P. fluorescens A506. The acylated ferribactin precursor is synthesized in the cytoplasm by NRPSs and auxiliary en-zymes organized in membrane associated complexes termed “siderosomes”. The cytoplasmic synthesis is detailed in the box at the bot-tom. PvdL synthesizes the conserved N-terminal tripeptide with its acylation, the other NRPS are responsible for rest of the peptide and therefore vary between strains with distinct sequences. The auxiliary enzymes MbtH, PvdG, PvdH, PvdA, PvdF, and PvdD play the indicat-ed roles (see text for details). The acylated ferribactin is exported most likely by PvdE into the periplasm, where it is deacylated by the Ntn-type hydrolase PvdQ. Subsequently, PvdP catalyzes the oxidative cyclization, resulting in dihydropyoverdine. PvdO, possibly in con-junction with other proteins, facilitates the final oxidation, yielding the characteristic pyoverdine chromophore. Thereafter, side-chain modification-pathways transform the original L-glutamic acid side chain either to the succinamide, catalyzed by PvdN, or the α-ketoglutarate, catalyzed by PtaA. The modified pyoverdines are then secreted via various transport systems such as PvdRT-OmpQ, and bind outside ferric iron. The complex binds to FpvA and is TonB-dependently taken up. FpvF and FpvC reduce and dechelate the iron, which is taken up by the FpvDE transporter. The apo pyoverdine is recycled. See text for details. 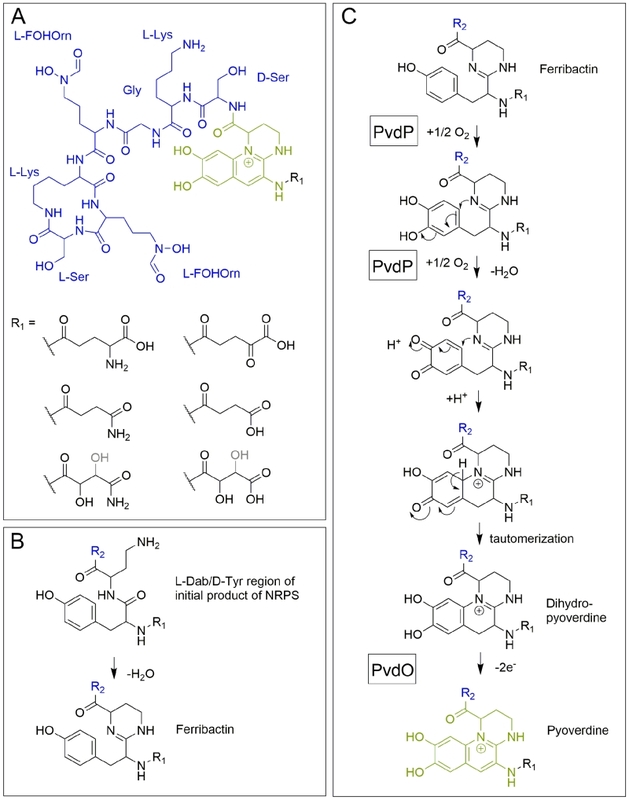 The elucidation of the first pyoverdine structure  led to a new era in pyoverdine research that focused on the biosynthesis. Pyoverdines (Figure 2A) are generally composed of i) a characteristic 2,3-diamino-6,7-dihydroxyquinoline fluorophore, ii) a variable acyl side chain attached to the 3-amino group of the fluorophore, and iii) a strain-specific peptide backbone, usually bound to the C1-carboxyl group of the ring system (reviewed in ), although so called isopyoverdines exist that have the peptide backbone attached to the C3-carboxyl group . The strain-specific peptide backbone varies in its sequence and can either be linear or (partially) intramolecularly cyclized. Furthermore, it can contain a number of unusual amino acids, such as β-hydroxy aspartic acid, β-hydroxy histidine, ornithine, cyclo-N5-hydroxy ornithine, N5-formyl-N5-hydroxy ornithine, N5acetyl-N5-hydroxy ornithine and N5-hydroxybutyryl-N5-hydroxy ornithine, of which the hydroxamates or β-hydroxy carboxylates contribute to iron-chelation. Additionally, the amino acids in the peptide backbone may also be isomerized to the D-enantiomeric form . FIGURE 2: Structural aspects of pyoverdines. (A) The structure of pyoverdine from P. fluorescens A506. (B) The condensation occurring in ferribactins. (C) Current model of periplasmic pyoverdine fluorophore biosynthesis. Note that the exact position of the hydroxyl group (black/grey) in malamide or malic acid is not resolved. See text for details. R2 (blue) designates the peptide moiety. Pyoverdine biogenesis starts in the cytoplasm, where non-ribosomal peptide synthetases (NRPSs) such as PvdL , PvdI  and PvdD  (depending on the strain) assemble an initially acylated ferribactin, the peptide precursor for pyoverdines . NRPSs are modular enzymes that add specific amino acids, one per module, to a growing peptide . Each module first adenylates its cognate amino acid at an adenylation domain and transfers it to a free thiol of a covalently bound phosphopantetheine cofactor. The peptide bonds are formed at condensation domains of the modules, thereby transferring growing peptides onto the phosphopantetheine-bound amino acid of the next module. Additional tayloring reactions and epimerizations can be catalyzed by specific domains . Finally, a thioesterase must cleave the thioester bond to release the peptide from the phosphopantetheine cofactor of the last module. Module 1 of PvdL incorporates either a myristic- or myristoleic acid side-chain instead of an amino acid as first building block , which is why ferribactin is acylated on the free amino group of the first incorporated amino acid. The first three amino acids of ferribactins, which are also incorporated by PvdL, are always L-glutamic acid (L-Glu), coupled via its γ-carboxy group to D-tyrosine (D-Tyr) and L-2,4-diaminobutyrate (L-Dab). This is important as the characteristic chromophore is derived from the D-Tyr and L-Dab residues, and we will later see that also the L-Glu residue at the N-terminus seems to be important, as several enzymes are produced that modify this residue. The unusual amino acids in ferribactin are synthesized by pyoverdine-specific biosynthetic enzymes. L-Dab is produced by PvdH from L-aspartate β-semialdehyde (L-ASA) , whilst L-N5-formyl-N5-hydroxy ornithine (L-fOHOrn) is produced in two steps from L-ornithin by PvdA-dependent hydroxylation  and PvdF-dependent formylation . It has been proposed that all these enzymes, together with the NRPSs, may form a membrane associated complex termed “siderosome”, which could circumvent cytoplasmic toxicity . Beside these enzymes, a small MbtH like protein has also been found to be associated with NRPSs of cytoplasmic ferribactin synthesis . The structure of this protein from P. aeruginosa has been solved and it was demonstrated to play a role in pyoverdine production or secretion . MbtH proteins have been shown to enhance the activity of NRPS adenylation domains to a variable extent , but the specific function of the MbtH like protein in ferribactin biosynthesis is unclear. Also, a soluble thioesterase PvdG has been implied to be involved in pyoverdine production . The corresponding gene pvdG is organized together with pvdL, and an interposon mutagenesis of pvdG abolished pyoverdine production . As only the last NRPSs of ferribactin synthesis, PvdD, has been shown to possess its own thioesterase active site motif , it may be that PvdG provides that functionality in trans for PvdL and possibly also for PvdI (Figure 1). PvdG might have overlapping function with a potential second soluble thioesterase (PA2411) , which could explain why its genetic inactivation did not abolish pyoverdine production . In specific strains, further auxiliary enzymes can be involved in cytoplasmic ferribactin biosynthesis steps. For example, there exist P. aeruginosa strains that produce a pyoverdine with an N-hydroxy-cyclo-ornithine residue, the so-called type-II pyoverdine, and a specific acylationprotein, PvdYII, is responsible for this . It is believed that most likely an acetylation of N-hydroxy-ornithine is required for the cyclization at some stage before the peptide is released from the NRPS . The acylated ferribactin is most likely immediately translocated across the cytoplasmic membrane into the periplasm by the ABC transporter PvdE . The best evidence for this role comes from genetic studies that demonstrated abolished pyoverdine secretion in a PvdE interposon deletion mutant of strain P. aeruginosa PAO1, and the complementation of this phenotype by expression of the pvdE gene . Notably, that study showed that the pvdE mutant also did not display any periplasmic pyoverdine fluorescence anymore, indicating that PvdE must interfere with a step prior to fluorophore formation, which could well be ferribactin transport. A potential role in transport of the pyoverdine precursor has also been suggested in bioinformatic studies, that categorized PvdE to a class of ABC transporters for modified cyclic peptides . Interestingly, two older experimental studies had already inactivated the pvdE gene with somewhat different results. The inactivation of pvdE in P. aeruginosa OT11 resulted in complete absence of pyoverdine in culture supernatants , whereas a transposon mutagenesis study identified four clones of strain PAO1 MT1 with inactivating insertions in pvdE that all showed a specific lower fluorescence in the culture supernatant . However, this fluorescence was not acid-quenchable and thus the compound was not pyoverdine. Instead it was speculated to represent a precursor of pyoverdine or a degradation product . A transport of acylated ferribactin by PvdE has not yet been demonstrated in vitro, and the absence of fluorescence in the periplasm might certainly also have other reasons, albeit the transporter function is definitively the most likely scenario. In the periplasm, the acylation of ferribactin is removed by the Ntn-type hydrolase PvdQ . This now established function was first proposed by Visca et al. . PvdQ was initially discovered as quorum-quenching enzyme, which acts by deacylating the autoinducer N-(3-oxododecanoyl)-L-homoserine lactone (3-Oxo-C12-HSL) by hydrolysis of its amide bond . The enzyme is produced as a proenzyme that autoproteolytically cleaves itself in the periplasm by excising a 23-residue spacer forming an 18 kDa α-chain and a 60 kDa β-chain, which reassociate to form a functional heterodimer . It is an interesting aspect that pathways of quorum sensing and pyoverdine production converge in PvdQ, which is a true bifunctional enzyme. The function of PvdQ in quorum sensing of P. aeruginosa is believed to alter the ratio between the two autoinducers found in this species, namely the PvdQ substrate 3-Oxo-C12-HSL and the short-chain autoinducer N-butanoyl-L-homoserine lactone (C4-HSL), which is believed to specifically adapt gene expression to specific host environments . C4-HSL is not a substrate of PvdQ . A good example for effects of an altered ratio between the two autoinducers may be the effect of markedly reduced pyocyanine production in response to reduced 3-Oxo-C12-HSL levels . Pyocyanine generates oxidative stress and harms host organs . It thus might not be coincidental that pyoverdine production, which depends on the presence of PvdQ, is coupled with a reduction of host-threatening virulence: Both may serve to establish a permanent stable habitat in the host. A phenotypic analysis of a pvdQ deletion mutant of P. aeruginosa strain PAO1 indicated that PvdQ is required for swarming, biofilm formation and virulence . While the swarming and virulence phenotypes could be attributed to the absence of pyoverdine, the biofilm defect could not be suppressed by external addition of pyoverdine and thus may relate to quorum sensing. Interestingly, the production of PvdQ is tightly regulated and induced under iron-limiting conditions, which is another support for the idea that the effects of PvdQ on quorum sensing are specifically required when pyoverdines are produced . It would be good to know why all ferribactins initially need to be acylated and deacylated again after transport. One reason could be a membrane attachment that could help to anchor the precursor compound at the cytoplasmic membrane, which may improve the efficiency of the synthesis at clustered siderosomes or help to avoid its diffusion into the cytoplasm and thereby could guarantee its efficient transport. Another reason could be some mechanistic requirement for the transport system. A third reason may simply be the introduction of a biogenesis step that is controlled by an enzyme, which coordinates pyoverdine production with quorum sensing and virulence. As PvdQ influences the adaptation of fluorescent pseudomonads to host environments, it has been considered as target for inhibitors that hopefully may help to reduce the ability to thrive in hosts by blocking pyoverdine synthesis. After having solved the structure of PvdQ from P. aeruginosa, researchers succeeded in identifying such inhibitors, which were capable to inhibit growth of P. aeruginosa under iron-limiting conditions . After ferribactin is deacylated, the fluorescent dihydroxyquinoline ring system is generated, which transforms the ferribactin into a pyoverdine. This ring system is strictly conserved in pyoverdines and provides a planar scaffold for two oxo-ligands of the siderophore. As mentioned before, ferribactin is always synthesized with the three N-terminal residues L-Glu/D-Tyr/L-Dab, and the tyrosine and diaminobutyrate residues of these form the fluorophore . In ferribactin, L-Dab 4-amino group is condensed with the carbonyl group of the neighboring D-Tyr (Figure 2B). An oxidative cyclization cascade as proposed by Dorrestein et al. likely results in the formation of the three-ring fluorophore (Figure 2C). In that oxidative cyclization cascade, the tyrosine side chain is first hydroxylated to form a catechol that is then oxidized to an o-quinone. This facilitates the intramolecular addition, involving the 1-amino nitrogen atom from the neighboring L-Dab cycle and the quinone ring, resulting after tautomerization in the dihydro-dihydroxyquinoline system of dihydropyoverdine. The initial hydroxylation and oxidation steps are catalyzed by the copper-containing tyrosinase PvdP , which thereby also promotes the cyclization and formation of the dihydropyoverdine. This study observed a completion of the fluorescent fluorophore in the in vitro PvdP activity assays and suggested that PvdP is responsible for the complete fluorophore formation , which contrasted earlier studies that proposed the existence of an iron-enzyme-catalyzed oxidation of dihydropyoverdine . Also the detection of secreted dihydropyoverdine in a Pseudomonas strain supported the view that a single enzyme does not catalyze the complete conversion of ferribactin to the final fluorophore . Indeed, a rapid autoxidation can in principle complete the fluorophore under alkaline conditions , but recent studies demonstrated that this does not occur under weakly acidic physiological conditions, as found in the periplasmic space . It could be shown that a mutant strain lacking the putative oxidoreductase PvdO produced the dihydropyoverdines, indicating that PvdP catalyzes only the initial hydroxylation and first oxidation, whereas the final oxidation depends on PvdO . PvdO as purified from a heterologous Escherichia coli system did not contain a detectable cofactor and was inactive . It remains to be clarified whether active PvdO can be obtained that carries out the second oxidation alone, or whether it needs to associate with other components, such as specific electron transport systems or possibly the enzyme PvdP. Importantly, PvdO and PvdP always occur together, and currently both seem to be the only enzymes that are directly involved in the formation of the pyoverdine fluorophore . As alternative to the above described oxidative cyclization cascade , a mechanism has been postulated based on the observation of a trihydroxylated “pseudoverdin” that was produced by a pyoverdine deficient mutant of P. aeruginosa PAO1, which was complemented by a cosmid gene bank clone to re-established fluorescence . The trihydroxylated “pseudoverdin” in that strain was not functional in iron acquisition and it was essentially an artificial system with unidentified genetic elements, but the resulting structure could permit an intramolecular Bucherer reaction as basis for the ring formation. Based on the identification of dihydropyoverdine-7-sulfonic acids, it was also proposed that a sulfonation can occur to facilitate this intramolecular Bucherer reaction . However, sulfonated dihydropyoverdines appear to be very lowly abundant and they might represent adducts of media constituents to the reactive dihydropyoverdine. As the conversion of dihydropyoverdine to pyoverdine most likely requires only one further enzyme, PvdO, and as the pvdO mutant did not accumulate a sulfonated dihydropyoverdine, we think that the Bucherer pathway is unlikely to be realized in this biosynthesis. The electron transport pathways that are involved in the oxidation reactions are of fundamental importance and have not yet been clarified. Most relevant in this respect are studies with P. fluorescens ATCC17400, which show that the periplasmic membrane-associated oxidoreductase CcmC is involved . CcmC is well-known for its role as hemochaperone in periplasmic c-type cytochrome biogenesis , but it does not seem to be the cytochrome biogenesis role of CcmC that is relevant for its pyoverdine-related role. A very interesting mutagenesis study could dissect both functions of CcmC, indicating that distinct regions of this protein are involved in the two processes . The inactivation of CcmC has been described to reduce the level of thiol-oxidation in the periplasm, suggesting that oxidized thiols or more generally the oxidation-power in the periplasm may be relevant for pyoverdine formation . In this context, it is interesting that the addition of cysteine to the growing ccmC mutant culture resulted in formation of ferribactin . As it is now clear that PvdP is responsible for the conversion of ferribactin to dihydropyoverdine, it is likely that electrons must be transferred from PvdP to a periplasmic redox active compound that requires CcmC functionality. While the conservation of the residues D-Tyr/L-Dab at positions 2 and 3 in all ferribactins is required for fluorophore biosynthesis, the conservation of the L-Glu at position 1 in ferribactins is not that easy rationalized. This acidic residue forms an amide bond via its γ-carboxylic group to D-Tyr and thus possesses free α-carboxy and α-amino groups. Importantly, mature pyoverdines usually do not contain these residues any more. Instead, depending on the strain analyzed, they usually possess a succinamide, succinate or α-ketoglutarate at this position, and sometimes malamide and malic acid are found, or even traces of intramolecular cyclized succinic acid (Figure 3). P. aeruginosa, for example, converts the glutamate completely to succinamide, succinate or α-ketoglutarate. It is unknown, why these modifications are made, but it has been speculated that they could play a role under specific environmental conditions or niches that could so far not be mimicked in pure cultures under laboratory conditions . FIGURE 3: The branched periplasmic pathways for pyoverdine tailoring. 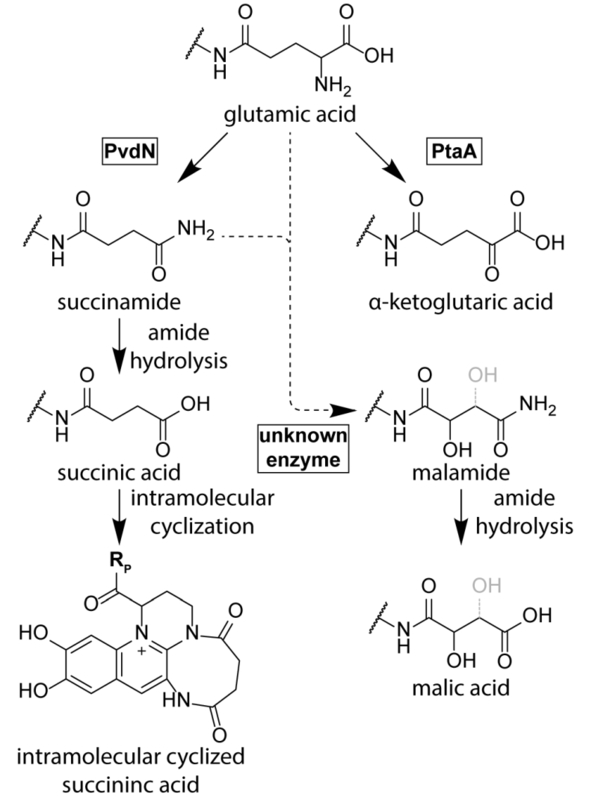 PvdN generates the succinamide residue and PtaA the α-ketoglutarate residue from glutamate. An unknown enzyme converts succinamide (most likely) or possibly glutamic acid to malamide in some species. The lower abundant succinic acid and malic acid pyoverdine forms are likely hydroly-sis products of the corresponding amides. Note that the exact position of the hydroxyl group in malamide and malic acid residues is not resolved. Until recently, no enzyme could be identified as being responsible for these “tailoring” modifications. The reason for this was the fact that the candidate proteins, the functionally uncharacterized periplasmic enzymes encoded in pyoverdine biosynthesis gene clusters, were believed to be essential for pyoverdine formation . Three of these periplasmic enzymes, PvdM, PvdN, and PvdO, are usually encoded in an operon. Interposon mutagenesis of the corresponding genes in P. aeruginosa indicated essential roles of these genes in pyoverdine biosynthesis, although it was already noted in the first of these studies that complementation analyses were required to exclude polar effects in the pvdMNO operon . In recent studies that used in frame deletions and complementations in P. fluorescens strain A506, which produces the same pyoverdine modifications as P. aeruginosa, it turned out that only the first gene in this operon is indeed essential, whereas PvdO is not essential, being responsible only for the final oxidation step of the fluorophore (see above), and the absence of PvdN resulted only in abolished formation of succinamide and succinic acid . This study therefore revealed the first tailoring enzyme for the periplasmic glutamic acid modification. PvdN is an interesting enzyme for two reasons: (i) It is a PLP-containing enzyme that catalyzes a new PLP-dependent reaction mechanism, a decarboxylation under retention of an amino group at the α-carbon atom , and (ii) it is transported by the twin-arginine translocation system as folded protein that requires cytoplasmic PLP binding to be transport competent . When the active site lysine is mutated, PvdN remains stuck in the membrane, most likely due to transport-incompatible, unfolded hydrophobic regions . As PvdN catalyzes the direct formation of succinamide from glutamate and is also required for the occurrence of succinate that is most likely the spontaneous hydrolysis product of succinamide, the formation of α-ketoglutarate from glutamate requires another enzyme, which recently turned out to be a novel PLP-containing transaminase, termed PtaA for “periplasmic transaminase A” . PtaA is usually encoded outside the large pyoverdine gene clusters, but an interesting exception has been recognized (P. putida H8234) where its gene substitutes the gene encoding PvdN. There are pyoverdine-producing pseudomonads that have both enzymes, PvdN and PtaA, some have only PvdN, and others only PtaA. Consequently, some strains produce the products of both biosynthesis branches, whereas others produce only products of one or the other branch . PtaA is a “normal” PLP-containing transaminase. As PtaA is also present in a number of species incapable of pyoverdine production, it has been suggested to also be involved in other periplasmic biosynthesis pathways, which is why it received the general name “periplasmic transaminase A” . What is surprising and what makes this enzyme unusual is simply the fact that it is active in the periplasm. Like PvdN, PtaA is transported together with its PLP cofactor in a folded conformation via the twin-arginine protein translocation pathway . The cofactor thus enters the periplasm together with its protein in a tightly bound form, and it can therefore be assumed that the PLP is somehow regenerated from pyridoxamine after each reaction cycle inside the periplasm. Together, the recent advancements in the field established that there are two independent branches for the glutamate substitution in P. aeruginosa and P. fluorescens strains, which are (i) the PvdN-dependent branch that results in the succinamide and succinic acid as well as the intramolecular cyclization product, and (ii) the PtaA-dependent branch that results in α-ketoglutarate. There is nothing known about the biosynthesis of the rarely occurring malamide and malate forms of pyoverdines yet, which are not present in the current pyoverdine biosynthesis model organisms P. aeruginosa PAO1 and P. fluorescens A506. While it is likely that the malate is the hydrolysis product of the malamide, the malamide could in principle be formed by an unknown hydroxylating enzyme that acts on succinamide. The introduction of the hydroxyl group might also occur earlier, but a hydroxylated glutamate intermediate has never been found, suggesting some direct transformation of succinamide to malamide. When PvdN is removed, PtaA converts all the pyoverdine to its α-ketoglutarate form. Conversely, the lack of PtaA results in the succinamide and succinic acid forms generated by PvdN. Removal of both tailoring enzymes leaves the original glutamate unaltered . It is tempting to assume that the tailoring steps occur after formation of the fully oxidized fluorescent pyoverdine. However, this may not be the case. The dihydropyoverdine formed by pvdO deletion strains is accepted by PvdN as well as by PtaA as the correspondingly modified dihydropyoverdine forms have been found . Apparently, the planarity of the attached ring system is not a prerequisite for substrate binding to these enzymes. Moreover, Budzikiewicz et al. detected a ferribactin with a succinamide side-chain , demonstrating that PvdN may even accept ferribactin as substrate, which shows that the ring system is not really relevant for the tailoring enzymes PvdN and PtaA. It is so far unknown to which extent the intermediates can be channeled from one enzyme to the next, but there is no evidence yet for such a channeling that could impose an order of events. After having summarized the knowledge about the enzymology of the biosynthesis steps, aspects of export, uptake, recycling and regulation need to be addressed to understand the physiology of pyoverdine biosynthesis. Pyoverdines can be exported via a transport system consisting of PvdR, PvdT, and OpmQ . This system has originally been shown to be involved in the secretion of pyoverdine that has been taken up from the environment and thus is recycled for multiple use , and later its involvement in transport of de novo synthesized pyoverdine was demonstrated . However, the PvdRT-OpmQ transporter cannot be the only export route, as strains mutated in this system are still able to secrete pyoverdines, albeit an accumulation in the periplasm has been demonstrated in such strains . Also a MexAB-OprM transporter has been implicated in pyoverdine secretion , but later studies indicate that the inactivation of this transporter had no significant effect on pyoverdine secretion . However, that study also indicated that the inactivation of the PvdRT-OpmQ system reduced pyoverdine secretion only to about 50-60%, which shows that also other systems must be involved. In P. taiwanensis, a type VI secretion system has been shown to mediate secretion of newly synthesized pyoverdine, and this study reports that the PvdRT-OmpQ system is not relevant for this process in their organism . Taken together, there is still considerable need to clarify under which conditions PvdRT-OmpQ systems are not only involved in recycling but also in secretion of de novo synthesized pyoverdines, and there is evidence that more not yet assigned transport systems are important. Organisms, especially those that live on or in host organisms, compete for the limited iron resources. Therefore, siderophore-uptake systems are usually specific for the siderophore that is used by the organism. Pyoverdines possess a highly variable, often even strain specific peptide moiety that confers distinguishable properties to the siderophore that can be taken up by differing uptake systems . Nonetheless, pyoverdine uptake systems exist that can use distinct pyoverdines of other strains . In the outer membrane, FpvA has been identified to be the ferripyoverdine receptor that recognizes iron-loaded pyoverdines . Its gene was cloned in 1993 , and its structure was later elucidated in great detail . A number of mutational studies tried to elucidate the residues involved in pyoverdine binding, signaling and transport . In 2009 it could be demonstrated by Greenwald et al. , that the first amino acid residues in the peptide backbone of pyoverdine determine the binding affinity of pyoverdines to their cognate or non-cognate Fpv’s. The uptake is probably energized by the direct interaction of FpvA with the TonB-ExbBD complex at the energized inner membrane, which transduces sufficient energy to the outer membrane for transport . P. aeruginosa has two TonB homologs, and albeit TonB1 seems to be more important for iron uptake, TonB2 can partially fulfill the function of TonB1 . FpvA not only binds ferripyoverdine but also to the iron-free apo-pyoverdine, which is not imported but exchanged by ferripyoverdine that is then imported . The exchange appears to be accelerated by TonB . However, it has been suggested that the observation regarding binding of apo-pyoverdine by FpvA might be an artifact and that the detected binding could be due to trace-contaminations of aluminum chelates . Indeed, FpvA can bind a wide range of other pyoverdine-metal complexes that in case of Cu2+, Ga3+, Mn2+ and Ni2+ may even be imported, albeit with a reduced rate. Furthermore, pyoverdine chelates of Al3+, Cu2+, Ga3+, Mn2+, Ni2+ and Zn2+ can induce pyoverdine production by binding to FpvA . Some strains possess several FpvA homologs with distinct or overlapping specificities for pyoverdines. A very extensive investigation in this matter was performed by Hartney et al. in 2013, who demonstrated the specificity of a multitude of Fpv homologs and their pyoverdine-scavenging potential in P. protegens Pf-5 . After import, pyoverdine is not degraded or modified, nor is it imported into the cytoplasm. Instead, Fe3+ is reduced to Fe2+ periplasmically, liberated from pyoverdine, and taken up by the ABC transporter FpvDE . Involved components are encoded in the fpvGHJK and fpvCDEF operons . The inner membrane proteins FpvG and FpvH are essential for iron release, and there is indirect evidence that FpvG catalyzes the reduction step . The other components, such as FpvJ, FpvK, or even the ABC transporter FpvDE and its two soluble periplasmic binding proteins FpvC and FpvF, affect the release partially . As expected for a binding protein of a ferrous iron ABC transporter, there is indirect experimental evidence for chelation of ferrous iron by FpvC . The thus recycled apo-pyoverdine is reexported as described above into the extracellular compartment by OpmQ-PvdRT . It has also been reported that pyoverdine can be stored in the periplasmic compartment  but this process is not yet understood . As mentioned in the introduction, iron starvation is the key signal for pyoverdine production. The regulator Fur senses ferrous iron ions in the cytoplasm and represses genes involved in iron uptake, including those encoding the regulatory proteins FpvR, FpvI, and PvdS . PvdS is a sigma factor required for the expression of pyoverdine biosynthesis genes and other, often virulence-related genes , FpvI is a sigma factor required for the genes encoding the outer membrane pyoverdine receptor/importer FpvA , and FpvR is an anti-sigma factor that binds to and thereby inactivates PvdS and FpvI . FpvR autoproteolytic cleaves itself at a periplasmic domain without any further degradation unless it contacts ferripyoverdine-bound FpvA . When this FpvR/FpvA contact occurs, which involves the activity of TonB (the transport-energizing inner membrane protein; see section on import above) , further proteolytic events that engage the protease RseP result in liberation of PvdS and FpvI and activation of their regulated genes . As the cascade begins with the sensing of a receptor-bound ferripyoverdine, it is noteworthy that some ferripyoverdine is required to activate the production of pyoverdine. 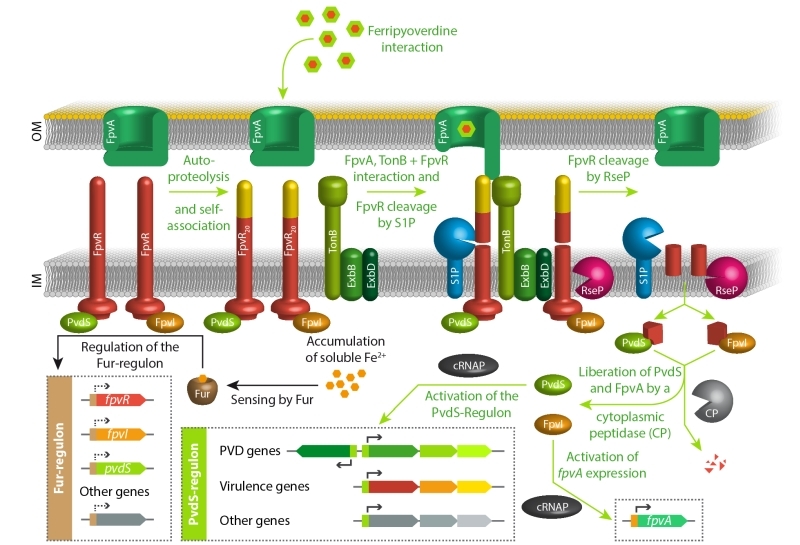 In the absence of ferripyoverdine, the system therefore adjusts a basal level of PvdS and FpvI dependent gene expression, caused by a low abundance of FpvR, and this basal expression is required for the above described pyoverdine-dependent sensing pathway . In agreement with this view, mutants defective in pyoverdine production cannot upregulate the PvdS regulon under iron-limiting conditions . Finally, it is important to emphasize that the regulatory pathways for the production of pyoverdine play important roles beyond pyoverdine production. As mentioned above, the PvdS regulon also includes genes that are not involved in pyoverdine biosynthesis. In P. aeruginosa, such genes are clearly contributing to virulence, as the suppressed virulence of a pvdA deletion strain that lacks pyoverdines could be partially restored by deletion of the fpvR gene that encodes the anti-sigma factor FpvR . This pvdA/fpvR double mutant strain constitutively expresses the PvdS-dependent genes without producing pyoverdines. Pyoverdines that are initially sensed by the regulatory cascade thus can serve as signaling molecules in host environments. The above principal signaling pathway is summarized in Figure 4. 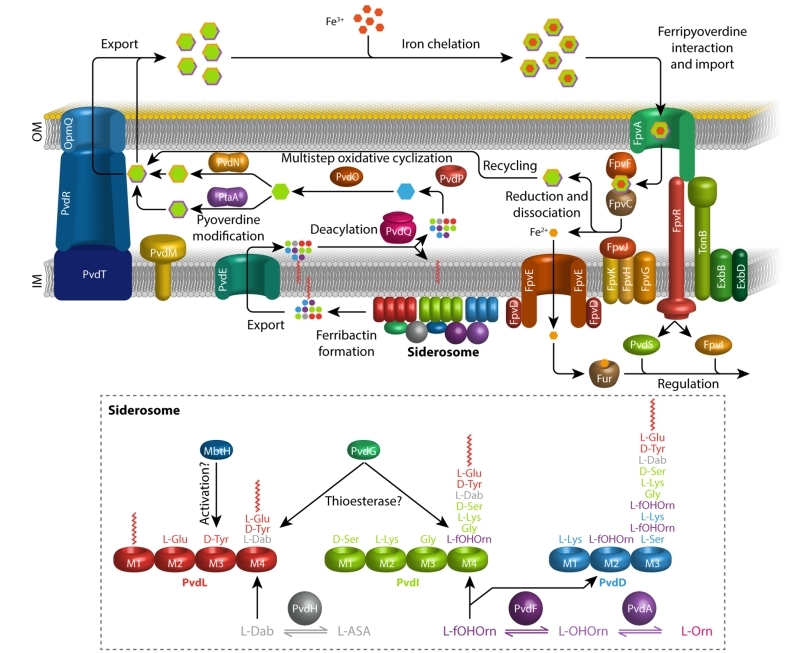 FIGURE 4: The key regulatory pathways for pyoverdine production in response to iron starvation. See text for details. Interestingly, the regulation of pyoverdine biosynthesis is even more complex, because signals other than iron starvation have modulating effects. Among these are influences by the regulator CysB , which may imply a coordination with sulfur availability or biofilm formation and alginate production . Also phosphate starvation has been reported to trigger pyoverdine production in host environments . Additionally, the LexR type transcriptional regulator AmpR, which affects expression of more than 500 genes related to metabolism and virulence in P. aeruginosa, has recently been implicated in the regulation of pyoverdine production , and also the level of bis-(3’-5’)-cyclic dimeric guanosine monophosphate (c-di-GMP) is reported to modulate pyoverdine production . Pyoverdines play important roles for many pathogenic and non-pathogenic pseudomonads that thrive in host habitats. It is important to understand the biosynthesis of pyoverdines, and this review intends to give a brief survey about our current knowledge and the open questions. There are still some components unknown and some catalytic mechanisms not understood. Beside the basics of biosynthesis, the physiological aspects will become more important in future, as the process has to be understood in terms of cell biology, communication, and host interaction. One of these aspects is regulation, which seems to become more complex and interwoven with multiple other regulatory pathways, ranging from biofilm formation to nutrient supply. Future will reveal what else we can learn from pyoverdines. M. Gessard, "Sur la fonction fluorescigène des microbes. In: Annales de l’Institut Pasteur. (Institut Pasteur, Eds). ", Masson, Paris. pp 801-823., 1892. A. Turfreijer, "Pyoverdinen, de groen fluoresceerende kleurstoffen van pseudomonas fluorescens ", Proefschrift, Univ. Amsterdam., 1941. H. Budzikiewicz, " Siderophores of the Pseudomonadaceae sensu stricto (fluorescent and non-fluorescent Pseudomonas spp.). In: Progress in the chemistry of organic natural products. (Falk, H. and Kirby, G.W., Ed). ", Springer, Vienna. pp 81-205., 2004. P. Visca, " Iron regulation and siderophore signalling in virulence by Pseudomonas aeruginosa. In: Pseudomonas. (Ramos, J.-L., Eds)", Springer US, Bosten, MA. pp 69-123., 2004. The publication of this article was funded by the Open Access fund of Leibniz Universität Hannover. This work was supported by grant BR 2285/7-1 of the German Science Foundation (DFG) to TB. The biosynthesis of pyoverdines by Ringel and Brüser is licensed under a Creative Commons Attribution 4.0 International License.